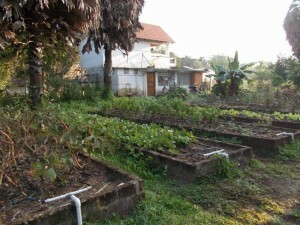 Growing vegetables was the first thing we did when Buddha Garden was established. It continues to be an important focus of our work. Vegetables take a lot of time and energy to grow and every day there is some work to do there. 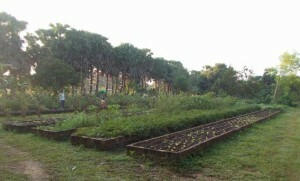 We do this in four different gardens, each one having a name in one of the languages of Auroville – English, French, Tamil and Hindi. 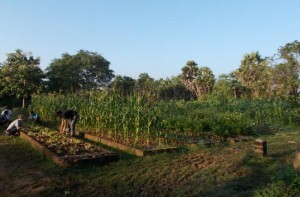 ‘Souryan’ means ‘sun’ in Tamil and every morning we watch the sun rise over this garden as we work. This was our first vegetable garden. To begin with our raised beds consisted of earth banks which were about a metre and a half wide and raised 50cm from the ground. Each bed had two, eventually three, drip irrigation lines on it. In this climate it is important to mulch or cover the soil well to protect it from the drying effects of the sun and the heavy monsoon rain. In the beginning we used straw which, while creating an excellent mulch, was expensive and organically grown straw was very difficult to find. For this reason we now use leaves from other Auroville communities. They break down faster than straw and tend to blow away in the wind, but provided we use a thick layer it works well and they bring a lot of extra organic matter to the soil. They are also used in making compost. The problem with these original beds was that they were very difficult to keep weed free as the weeds grew up the sides of the bed from the paths towards the irrigation pipes on the top of the bed. The sides of the bed were quite delicate and had a tendency to wash away in the monsoon as well as drying out in the hot season. For this reason vegetables could not be grown on the sides of the bed so the growing area was limited to the top of the bed. Early on we thought that it would be a very good idea to have brick sides on the bed. This would create a separation between the weeds on the path and on the bed making it easier to keep the bed weed free. It also increased the planting area on the bed as there were no vulnerable sides that could not be planted. In the early years we made an experimental brick bed that seemed to work very well and we also tried using stones such as cadaper (a cheap form of marble) and more recently granite pillars for the sides. The problem with all these solutions was that they were very expensive to build. We managed to obtain a grant to build 9 such beds in the Souryan garden and eventually we raised funds from various places so that every garden now has raised beds. In this garden we eventually we also put up permanent climbing frames to make it easier to grow plants like beans and snake gourd. Before we had these climbing frames we used bamboo poles which were attacked by termites and had to be changed every year. They only lasted a few months and so we were constantly having to replace them. Which was a difficult task for the people who came to help us who were not necessarily experienced in doing this sort of work. In Buddha Garden all the regular work in the gardens is carried out by the people who live here (presently two Aurovilians) with the help of volunteers and students. This infrastructure of brick raised beds and permanent climbing frames has been developed so that unskilled people can easily do all the work. Priyog (which means ‘research’ in Sanskrit), like the Souryan garden, has brick raised beds, but has no permanent climbing frames. So far we have not had the funds to do this. 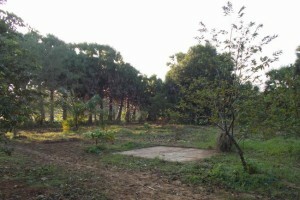 Recently at the back of Pryog garden we created Pryog orchard. This has a wide variety of local food producing trees with information about them. Le Jardin (which is French for ‘the garden’) has a number of brick raised beds as well as some made of granite pillars. These have the advantage that they need no special skills to set up and they are moveable. We suggest these as being a good idea for someone who wants to set up a raised bed but isn’t sure whether it is going to be permanent. We also have an irrigated orchard in this area. 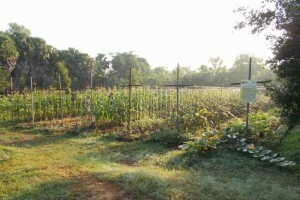 On the small beds in this garden we grow all the seeds we use in Buddha Garden that can be grown in this climate. In Auroville it is too hot to produce the seeds of lettuce, roccolla and radish so these have to be sourced from cooler places. In this garden we also have a bed of pineapple plants.